My friend Narelle from Nyngan (country NSW), owner of the Nyngan Craft Shop, is holding a Quilt Exhibition this Friday. I wanted to let everyone know the details of this event and if you are in the area hopefully you can show your support. This week at the Nyngan Craft Shop we would like to invite you to come and see a range of quilts made by our local quilters. On Friday 26 May 2006, from 10.00am, we will be hosting our first Quilt Exhibition there will be a range of quilts from lap to king size quilts, we also will have a 200 year old quilt on display. Cost is $5 for morning or afternoon tea. There will be voting available for your favourite quilt with a gold donation for each vote. All donations go towards the Cancer Council. We look forward to your company when you come and have a look at the quilts at Outback Country Crafts Nyngan from 10am. Outback Country Crafts is located at 2 Nymagee Street, Nyngan. I hope this day is a great success, Narelle! 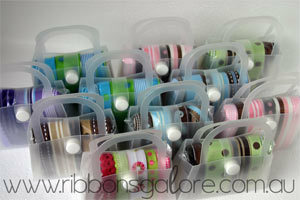 The shop will be stocking some ribbon packs from Ribbons Galore. 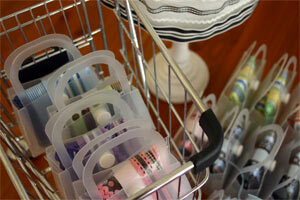 Narelle and her friends have been great supporters of Ribbons Galore. Thank you girls! Well last night a cracking thunderstorm rolled in just after dinner. Soon after the storm started, I heard the sound of little hard pellets hitting the roof, it was hailing. It hailed, and it hailed and it hailed. The girls and I thought it wasn't going to stop. I think it's the most hail I've ever seen, and it settled on the ground for at least an hour after the storm had passed. We got leaks in places that had never had leaks from before, and realised that the hail was filling up our downpipes and stopping the water flow off our roof. The water was leaking back in under the gutters. There was so much excitement (that is, running for towels and buckets), the girls missed the end of Home and Away!!! After it had all stopped I bravely went outside to get some photos. The top right on is the pile of hail from one of the downpipes. Also, I'd like to thank everyone for their nice comments and emails about the two design teams I've joined recently. Your comments are appreciated. I'm thrilled to join the Paper Salon design team. I received the news a while ago, and now the full DT team is on the Paper Salon website. The Paper Salon products are gorgeous, and span the stamping, card making and scrapbooking crafts, with rubber stamps and ink pads, card bases and envelopes and more recently scrapbooking papers. Make sure you have a look at their Tailored Tins, they are just sooo cute; die-cut, self adhesive, unmounted rubber stamps, so easy to use and easily stored in a little tin! 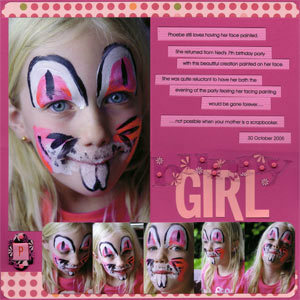 I'm teaching a few classes at Scrapabout Australia during June and July. I had a great group of ladies in my last class in April and enjoyed teaching my Party Time class. Thank you Leanne for asking me back! I'm looking forward to these classes. Here's a sneak peak for the class in June. 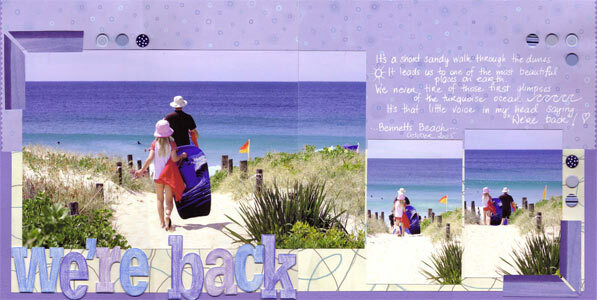 During this 'Year in Review' class you will combine many photos on a stylish double page layout, showcasing your year's favourite activities. This is a photo-focused layout, so please bring your photos. The class sample is now on display at Scrapabout Australia. Please contact Scrapabout Australia to book into this class. (The contact details can be found on their website.) Leanne also has the details of the photos to bring. As with most of my in-store classes, you will be able to choose your own products/colours to suit the photos you are scrapping. This class is very similar to a class I taught earlier this year, this time the sample uses some of Scenic Route's lovely bright papers and some Heidi Swapp and Fontwerks products. Stay tuned for sneak peaks of two more classes in July, the dates are already over there to the left in the sidebar. Class samples are now out at the store. The latest edition of Scrapbooking Memories is out, and it was my turn for a Scrappin' Step by Step. This article focussed on monochromatic colour schemes. Here's my layouts from this edition. All the details are in the magazine. Unfortunatley the colours in my copy of SM were very subdued, so hopefully you'll see the full colours in the layouts here. Thanks for looking and visiting my blog. Here's hoping Mother's everywhere had a lovely relaxing day yesterday. 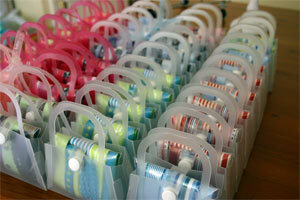 We have been busy here packing these cute little ribbon handbags for Donna Loughnan of Scrapanalia. Donna holds monthly scrapping crops and always has new products flowing through her doors. She is located in Melbourne (Coburg) and you can find her contact details on the Scrapanalia site. I met Donna earlier this year at the Scrapilicious Tassie Retreat and she was very interesting in our ribbons. So we are happy to say our ribbons have landed in Victoria and will be available for sale from Donna. Thank you Donna for supporting Ribbons Galore. 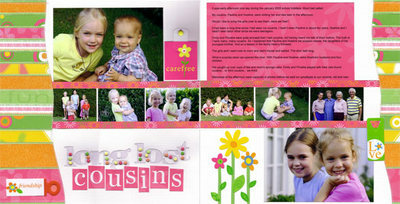 Well I've discovered over the last week how hard it is for a scrapbooker to survive without a photo card reader. It surprised me how often I take a photo these days and head straight to the computer to download it...especially when I can't do it! Anyway, all is now well and the card reader is replaced and working just fine. 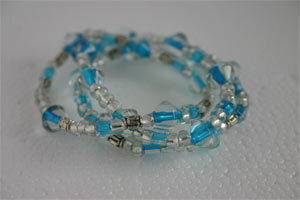 Here's a pretty little bracelet set Emily made last weekend for her friend's birthday present. The girls and I have been doing lots of beading lately. There's a fabulous shop up at Hawks Nest that sells every kind of bead you could imagine (in my opinion). When we go to Hawks now we seem to spend a long time (and sometimes a lot of money) stocking up on beads for necklaces and bracelets.